The world of showbiz is made up of different people who serve different roles, and function in a variety of capacities, and one of the most important people are those in the background. Publicists are undoubtedly one of these background people yet they are vital to the life and fame of most of our favorite stars. Publicists make sure their clients get the best out of their stardom, and one of the top people in the game is Vicky Karayiannis. She has worked as a publicist in Paris, France and has run in the same circles as well known celebrities. 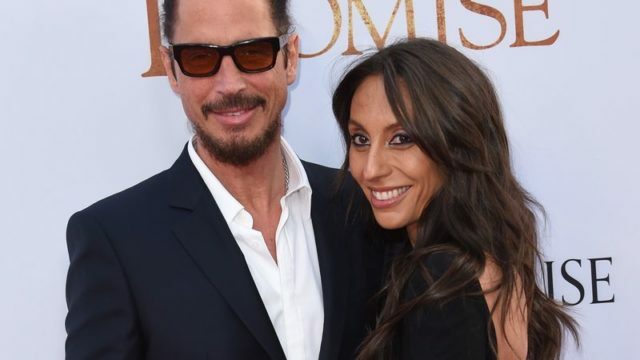 She is however popularly known as the widow of the musician Chris Cornell, who she met in the line of her work. Keep reading to learn about her life. Karayiannis was born in 1987 on the 13th of August; however, there is no information available about her father. Her mother’s name is Toni Karayiannis and she has one sibling – a brother named Nicholas – and both of them bear their mother’s last name. Vicky is of Greek heritage and reports show that her family owned a restaurant line and also had musical affiliations. Her brother Nicholas works as a DJ in New York and uses the moniker DJ Nick Blast. The family practiced the Greek Orthodox mode of Christianity. Vicky Karayiannis has managed to live a life that is under wraps for a long time and as a result of this, a lot of things about her life is not known; this includes her formal education, the type of life she led in her childhood or even details about her career and the things she has achieved in her career. It is however known that she has a job as a publicist and works in Paris, which is why she is referred to as a French-based publicist. In 2003, Vicky Karayiannis met her would be husband – Chris Cornell – in France. He was touring Europe at the time with his band – Audioslave. The two met when the band came to France and later in the same year, he asked Vicky to marry him with a ring from the American jeweler Harry Winston. It is safe to say that their romance bloomed in the short time they had known each other and the following year, both of them got married. The couple welcomed their first child, a daughter, in September 2004 and Vicky named her daughter Toni, after her mother. In December 2005, they welcomed a second child, this time, a boy. He was named Christopher Nicholas – after his father and his uncle, Vicky’s only brother. Chris Cornell was born Christopher John Cornell and he was an American musician who made songs that belong to the genre of rock; he worked with the bands Soundgarden and Audioslave. Prior to Cornell’s marriage to Karayiannis, he had been married to Susan Silver who was the manager of the band Soundgarden (he was part of at the time) as well as Screaming Trees and Alice in Chains, all rock bands. Cornell and Silver started to date in 1985 and they got married in 2000, they had a child together, a daughter; Lillian Jean. The couple divorced four years after getting married, in the same year he met Vicky Karayiannis. In 2012, Cornell and Karayiannis created a foundation which was named after them; the foundation was created to help children who are homeless, poor, abandoned or victims of abuse. Chris Cornell once put into the foundation some of the money made from selling concert tickets in 2013. Vicky Karayiannis’ work on the foundation was the way she announced herself to the world. After getting married to Cornell, she still managed to maintain a low profile which was a successful attempt until the death of her husband. The death of Chris Cornell made her more accessible to the public. Cornell died on the 18th of May 2017 and an autopsy conducted on him ruled his death as suicide by hanging. Karayiannis in 2017 planned to sue his doctor for prescribing drugs that altered the mind of her husband because according to her; he was not the type of person to commit suicide. From pictures and videos it is clear to see that Vicky Karayiannis is a tall woman, she has a height of 6 feet and 2 inches, which in meters is 1.88. It is a height that she wears really well with her slender frame.